For the first time in many years, global software major Infosys net profit went up in the fourth quarter but declined yearly for the fiscal 2018-19 owing to non-operational reasons, said the company on Friday. In a regulatory filing on the BSE, the city-based IT behemoth reported Rs 4,074-crore consolidated net profit for the fourth quarter (Q4) of fiscal 2018-19, registering 10.4 per cent annual and 12.9 per cent quarterly growth. For the fiscal 2018-19, net profit, however, declined 3.9 per cent annually to Rs 15,404 crore from Rs 16,029 crore in the previous fiscal 2017-18. Under the International Financial Reporting Standards (IFRS), consolidated net income declined 11.6 per cent annually to $2,199 million for FY 2019 from Rs $2,486 million a year ago. "The annual net profit declined due to Rs 88-crore ($12-million) additional depreciation and amortisation expenses on de-classification of Panaya and Skava subsidiaries from assets held for sale," said the firm in a statement. The $18-million reduction in fair value of Panaya in the fourth quarter of fiscal 2017-18 and $39 million for the fiscal 2018-19 and $65-million in the value of Skava during the same period have also led to decline in annual net profit. Consolidated revenue for the quarter grew 19.1 per cent annually to Rs 21,539 crore but was flat (0.6 per cent) quarterly. Under the IFRS, net income for the quarter increased 1.6 per cent year-on-year (YoY) to $580 million, which is 15.5 per cent up quarterly. Gross income for the quarter under IFRS grew 9.1 per cent YoY to $3,060 million, which is 2.4 per cent up quarterly. Consolidated revenue for the fiscal, however, grew 17.2 per cent annually to Rs 82,675 crore from Rs 70,522 crore in the previous fiscal (2017-18). Gross income for the fiscal under IFRS grew 7.9 per cent annually to $11,799 from $10,989 million a year ago. The company projected 7.5-9.5 per cent revenue guidance for the fiscal 2019-20 in constant currency in dollar terms. "The operating margin will be in 21-23 per cent range for the fiscal 2019-20," said the statement. Operating margin was 22.8 per cent for the fiscal 2019. The company posted Rs 4,618-crore operating profit for the quarter, registering 3.3 per cent yearly growth but 4.4 per cent decline quarterly. The company added 101 clients for the quarter, taking its total to 1,279 by March 31 from 1,251 a quarter ago and 1,204 a year ago. As many as 11,587 techies left during the quarter, resulting its attrition going up to 18.3 per cent from 17.5 per cent a quarter ago and 16.6 per cent a year ago. The company admitted that overall attrition remained high despite its focus on arresting it. With a net addition of 2,622 new employees during the quarter), the company's headcount increased to 2,28,123 from 2,25,501 a quarter ago and 2,04,107 a year ago. 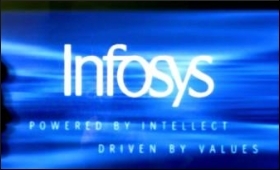 "We completed the first year of its transformation journey with strong results on multiple dimensions, including revenue growth, performance of digital portfolio, large deal wins and client metrics," said Infosys Chief Executive Salil Parekh in the statement. The company's board recommended a final dividend of 210 per cent or Rs 10.50 per share of Rs 5 face value. With an interim dividend of 140 per cent Rs 7 per share, the total dividend for the fiscal 2018-19 is 350 per cent or Rs 17.50 per share. The company also bought back shares worth Rs 1,546 crore out of total buyback size of Rs 8,260 crore since March 20 after receiving regulatory approvals. "Our planned investments have started yielding benefits. As we look ahead into fiscal 2020, we plan to deploy various measures of operational efficiencies across businesses," said Parekh. Chief Operating Officer Pravin Rao said the company had an over $1.5-billion large deal TCV (total contract value) in the quarter, as a result of which the TCV doubled year-on-year. "Realization per billed employee was steady, reflecting increasing usage of automation in core services and faster growth in digital services," said Rao. Chief Financial Officer Nilanjan Roy said the company had a forex gains from its proactive hedging strategy. The company's blue-chip scrip, however, gained Rs 4.70 to close at Rs 797.85 when Friday trading ended on the BSE from Thursday's closing of Rs 743.15 and opening price of Rs 746. The shares also traded at a high of Rs 751.50 and a low of Rs 741 during the intra-day trading sessions.